1964 Citroën for a Friendly $12,400! They say you should keep your friends close, and your enemies closer. Today, Nice Price or Crack Pipe has a Citroën that's small enough for you to do both! Yesterday, we checked out a low-mileage 944S which engendered one of the healthier debates over Nice Priciness, or Crack Piperdom. Who knew a Porsche could be so polarizing? In the end (front end, as this was a 944) it walked away with a pretty decisive 74% Nice Price win, so the haters may have been disproportionately vocal, or just too lazy to vote. 1987 Porsche 944S for a Traditionalist-Offending $12,000! Something else that's lazy is the performance of today's contender, which is an out of the ordinary and eclectically-styled 1964 Ami6 from Citroën. Meaning Friend in its native tongue, and offered up on eBay from its adopted home of Milwaukee, WI, this bigger brother to the 2CV is something you'll probably never see coming your way here in the land of Freedom Fries. But, having considered this one, you won't be left standing there wondering what just bleu bayou, should one pass by. The $12,400 Buy-It-Now price reflects its lofty position on the supply side of the economic equation- while common in France, they're rare as mime appreciation societies here in the U.S.. Also reflective is how nice this car appears, which is; very. That's because of a recent restoration, mechanical overhaul, and a re-spray in sacre-bleu back in 2007. The Ami6 was built between 1961 and 1978, and was intended to be a more civilized compatriot to the agrarian Deux chevaux- no baskets of eggs for the Ami! The country mouse/city mouse differences were mostly in the body, which features slide-open windows and a traditional trunk. Mechanically, it is the 2CV, continuing that car's leading/trailing arm suspension and horizontally-opposed air-cooled twin. As all that luxury (remember the windows?) added weight, the Ami received an enlarged prostate motor of 602-ccs, still allowing it to limbo under the government-imposed 610-cc tax limit. That provides 24 bhp which still took over 30 wacks to get its 1,360 lbs up to 50. Top speed is about 65 mph, given enough room to build up a head of steam and a tail wind, while a light drizzle hitting the windscreen may drop that by a few. As proof that those 24 ponies are really all you need, the seller includes some YouTube Cinéma vérité shorts, including the following, simply titled: Ma voiture est un poisson très grand. You might have noticed an iconic, and some might say bizarre, styling feature of the Ami which is the reverse-raked rear window. Similar to the Mercury Monterey or Ford Anglia, the design affords plenty of headroom as well as makes the car look like it's doing 20 while just standing still. The yellow Cibies and three-lug rims (check out the spare) complete the Franco-bona fides of this little salon. So, would you pay $12,400 so you and three of your Amis (we recommend Rachel, Monica and Phoebe) can travel in Gallic style? 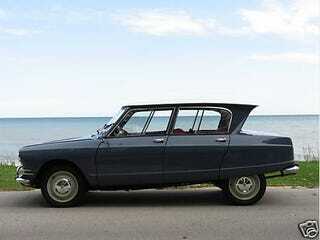 Or does that price make this Citroën a friend in name only? eBay Packers or go here if the ad disappears.